What it is: A huddle is a quick gathering of the nurses and CNAs working together in a 2-way exchange to share information about each resident as everyone starts work and to recap and pass along to the next shift any new information (for implementation guidance and how-to’s, please visit Pioneer Network’s web-based Starter Toolkit and newly released Implementation Handbook for Engaging Staff in Individualizing Care). Why it is important: Staff closest to the resident have a forum to share vital information and effective ideas, to coordinate teamwork and problem-solve any issues on the spot. How did high-engagement huddles at shift change help Mary? As the team comes together to discuss Mary at shift change, CNA’s are well informed of Mary’s customary routines and daily schedule from other consistently assigned staff. Mary’s caregivers share her background and daily routines with the rest of the team and the clinical team shares thoughts to maximize solutions and results. Mary’s sleeping preferences are recorded in her care plan. Therapies are scheduled later in the day. Dining staff become aware that Mary would like a late breakfast (usually just some cereal and coffee) and her big meal is expected in the evening. All are aware to monitor her and share any early warning signs of distress or depression. What happens in an environment without high engagement huddles? Without high engagement huddles, the clinical team may communicate on some of Mary’s clinical and behavioral concerns, but will not have the added detail to minimize Mary’s distress by following her customary routines. Without understanding the causes of her distress, the clinical team might resort to trying to control her expressions of distress, which could result in the use of antipsychotic medication. Not realizing that Mary may be less likely to eat or drink early day, Mary could lose weight and become dehydrated. 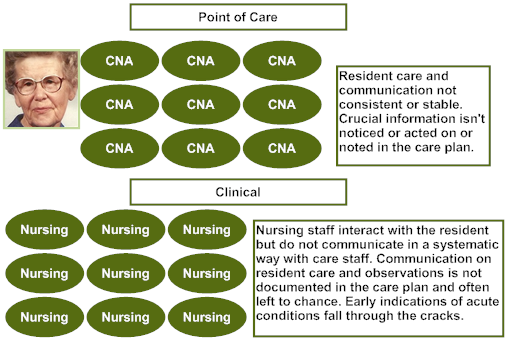 The clinical team also does not have CNA observations to support Mary’s day-to-day mood which could help to better understand any new or persistent clinical issues (e.g., pain). 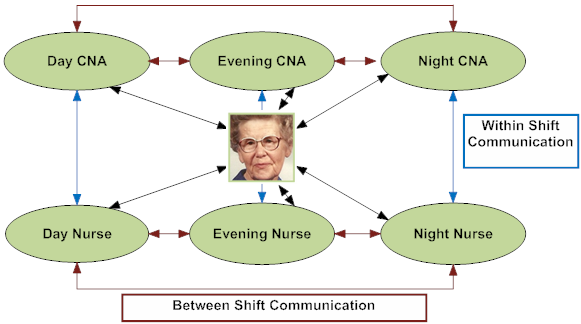 CNAs also do not have systems to share what they know from shift to shift. Mary will be on a downward spiral of avoidable decline.